ÉNORME - AUCUN AUTRE CÔTÉ OCÉAN / FRONT HOUSE COMME CELA PARTOUT DANS OC. Commodités modernes tout au long de cette grande maison de vacances pour les familles de plage situées à moins de 100 mètres du sable. Construit en 2005, il dispose de 6 chambres et près de 3000 pieds carrés sur 3 niveaux. Chaque niveau a un terrasse privée / balcon avec vue sur l'océan qui donnent aussi la piscine privée ci-dessous. Belles téléviseurs dans chaque chambre ainsi que les zones de vie. La piscine de détente est partagée seulement avec la maison d'à côté (ils sont voisins amicaux de l'été!). L'emplacement 124e rue est très familial et relativement calme pour la plupart des quartiers de OC. De nombreux restaurants et magasins sont à distance de marche ainsi que des activités comme le mini-golf et Northside Park. Vous ne trouverez pas une location comparable en OC. NOUS NE louer à des groupes d'étudiants. - Rangement avec chaises de plage, parapluies, boogie boards, etc..
Amazing house in great location! Had an amazing stay at this wonderful house!! Layout is perfect for large groups we had 15 and everyone had plenty of space. Open living area on second floor was a wonderful gathering place. This beautiful house is in a great location near so many restaurants and shops. Hope to return next year!! Great property for large famiy group at the beach. Property was very close to beach, lots of toys & games for all ages, well stocked kitchen with appliances, pans & dishes. The 3 floors made it easy for all to have space, especially with the middle floor being used solely for eating &entertainment. Property could use a little TLC, beginning to show some wear on furnishings, however, our stay was over Labor day at the end of the season which could account for some of it. Great beach house. A lot of steps though. I had a disabled brother who visited me and it was very hard for him to make it up to the living/kitchen area which is where everything happens. As soon as you open the front door there are about 15 steps and then another 15 - 18 steps to make it to the living area. This does not include any more steps on the upper floor to the other 3 bedrooms. My husband and I are in our 60's and all these steps were a problem for us especially when we arrived and left when there are numerous suitcases and supplies for the week. Close to the beach though. No major highway to cross to get to the ocean. A lot of beach chairs, umbrellas, sand toys, boards, inner tubes, etc, that you can use. Clothes dryer doesn't work very well...took a long time to dry a load of light wash. Other than that was very well supplied with kitchen utensils, pots and everything you will need for your stay. Over all I would recommend this beach house for your vacation as long as you are in great shape for all those steps. This house was just as advertised. Plenty of room for everyone & super close to the beach! Great location! You could walk to many restaurants and attractions. The house was spacious so we never felt on top of each other. A great house for 12-14 people! Gena was always quick to respond to any questions we had. We had a wonderful time at Ryan's Reef. Beautifully decorated, well stocked kitchen, and perfect location. Wonderful place for a large family or group of friends. We had a wonderful time staying at this property for the second year in a row for our family get-together. 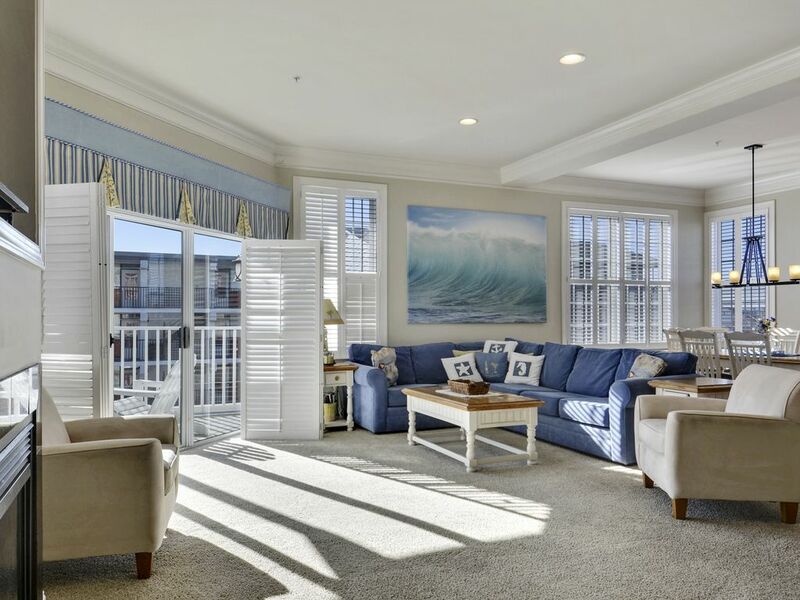 The location is perfect for the beach, restaurants, miniature golf and only a short car ride to the boardwalk and Jolly Roger amusement park. Gena is great to work with and the house is well-equipped with beach chairs, games and toys for the kiddos and other amenities for a family on vacation. And the pool is just an added bonus! Il existe d'innombrables activités à Ocean City au Maryland pour les familles. We require 7 night minimums Saturday to Saturday during peak summer season, but will consider 3+ night rentals during other times of year. Holiday weekends such as Memorial Day, Labor Day and Thanksgiving require a 4 night rental. WE DO NOT RENT TO STUDENT GROUPS.